From eggnog to champagne and hot chocolate to hot toddies, ‘tis the season for sipping, slurping and toasting! And while there are always plenty of drinks to go around, it’s easy to find oneself short on places to put them, especially in a house filled with revelers. 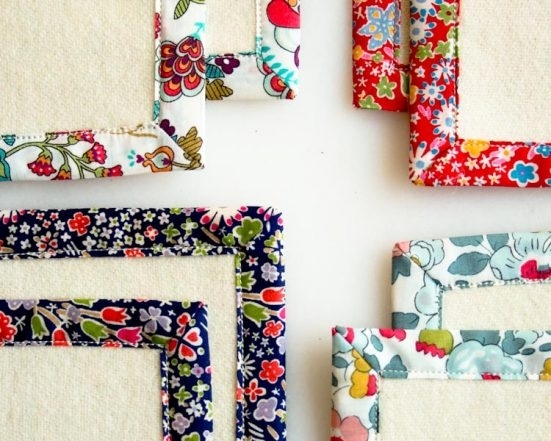 Let these Liberty Coasters come to the rescue! 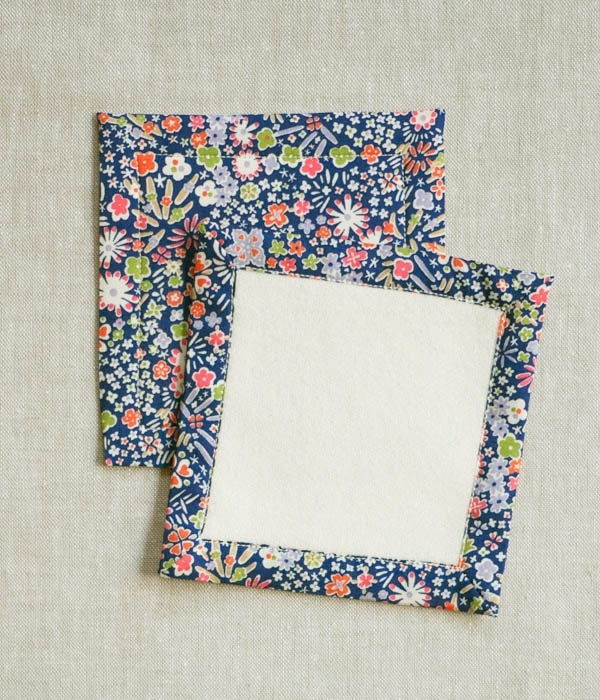 With their mitered corners and festive Liberty of London prints, these coasters beautifully accompany even the fanciest holiday cocktail, while Dorr Mill’s Wool Yardage lining makes them sturdy, absorbent and most important, useful. These are enough materials to make twelve 4 x 4-inch coasters. Prewash and dry all fabrics before starting. 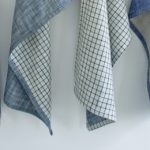 Do not wash the interfacing. 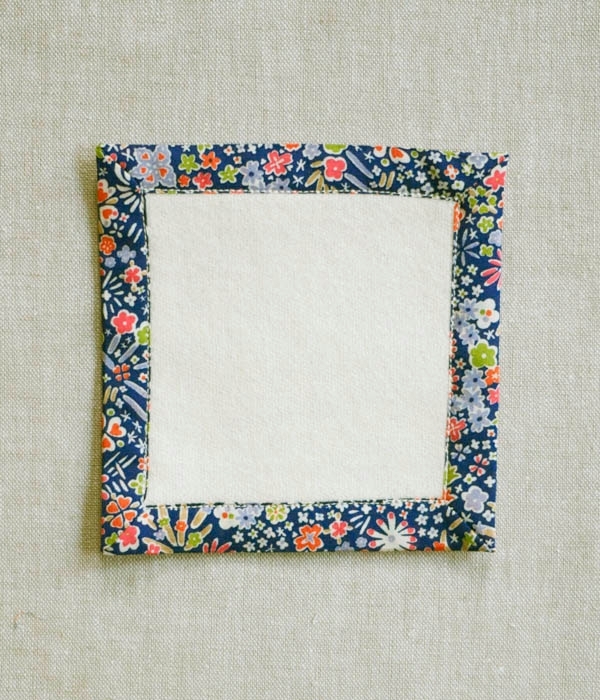 The wool will felt and shrink in the wash.
Cut the wool and interfacing into twelve 4 by 4-inch squares. 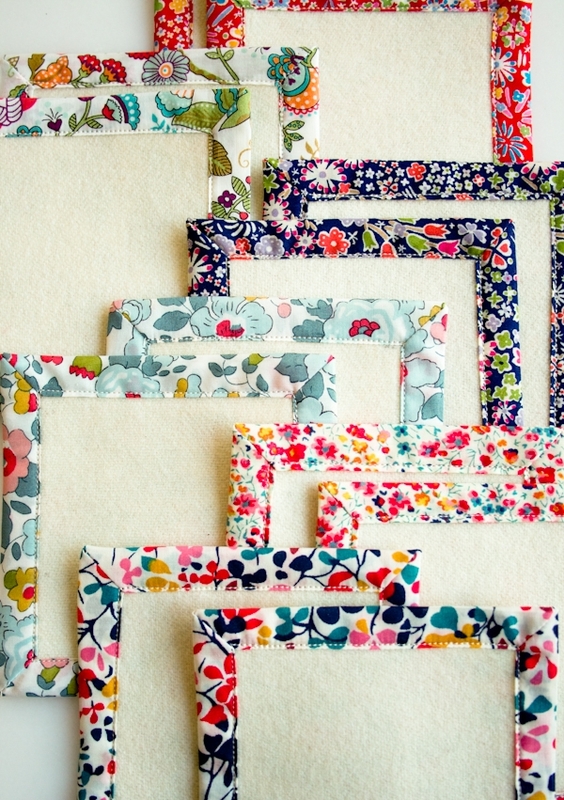 Cut the Liberty into twelve 6 by 6-inch squares. 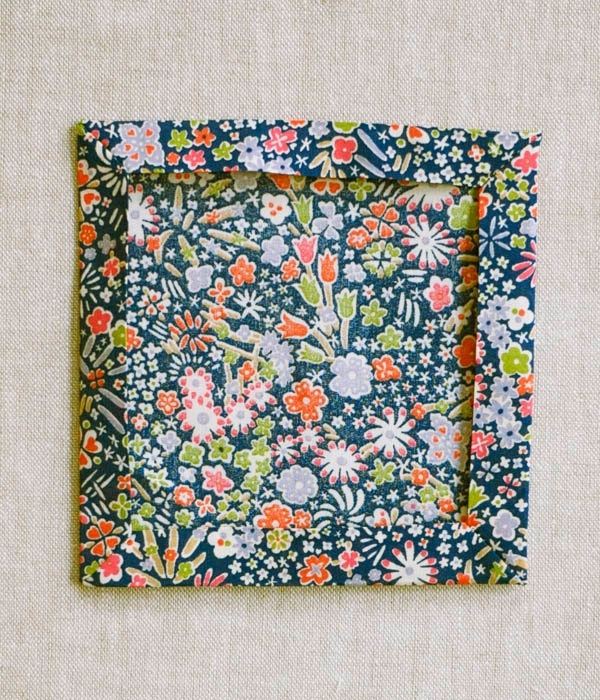 You will get two squares out of each Liberty print. 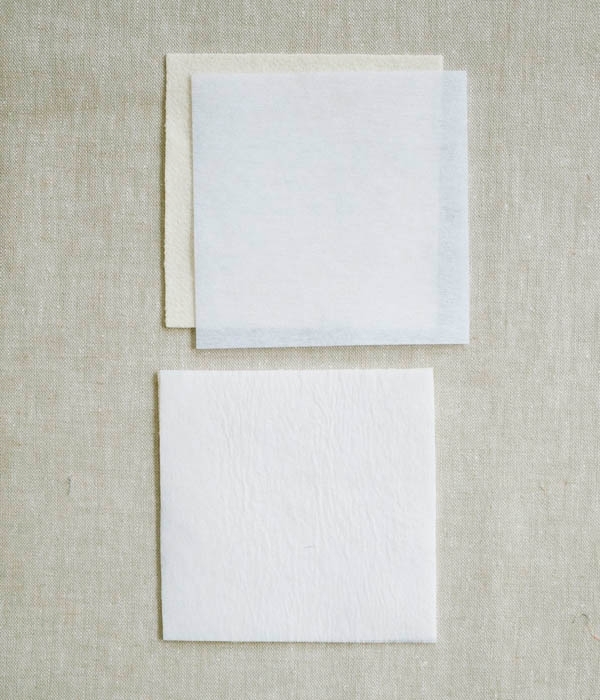 Using a hot iron and following the manufacturer’s instructions, apply one square of interfacing to one square of wool. 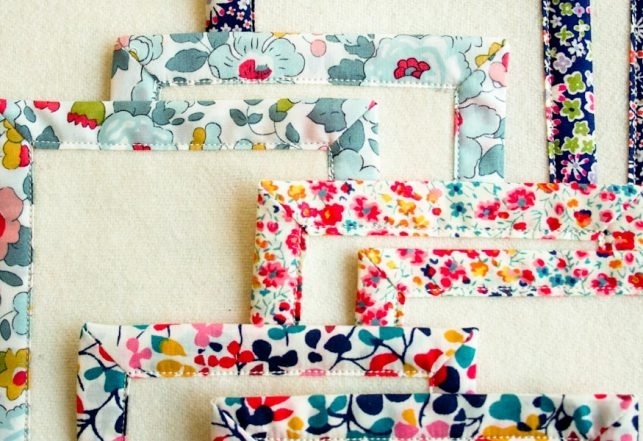 Repeat with the remaining wool and interfacing squares. 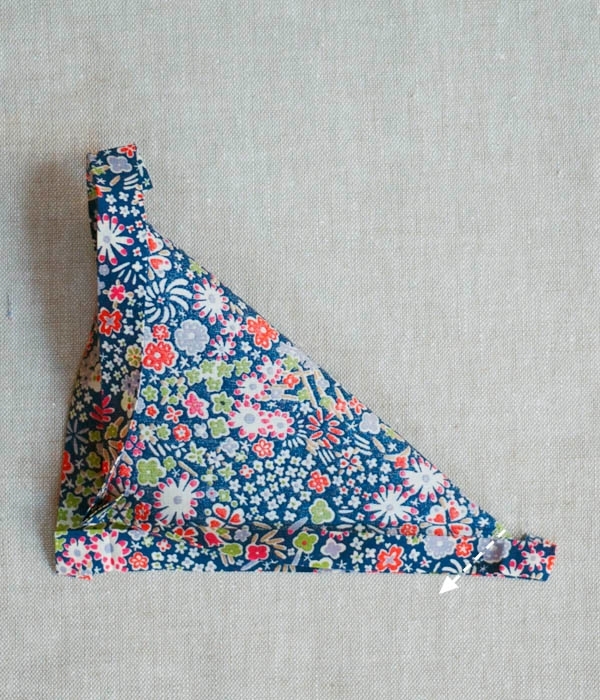 With the wrong side of a Liberty square facing up, fold and press all four sides ¼ inch towards the wrong side. 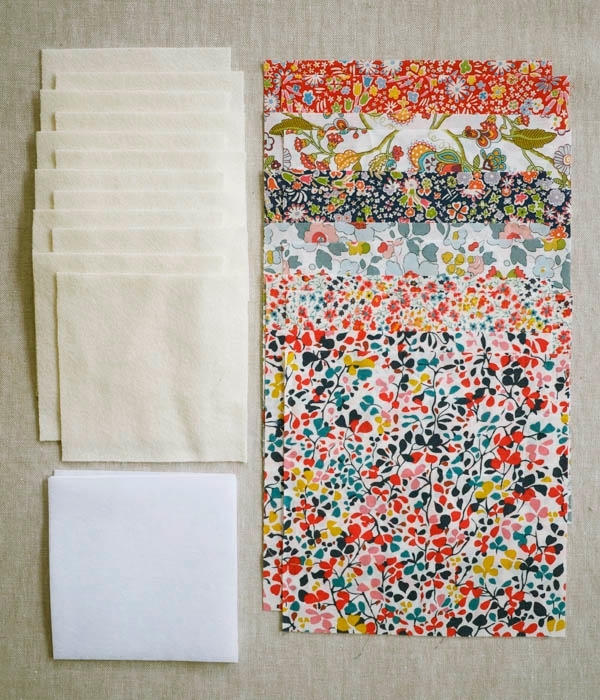 Now fold and press all four sides 1/2 inch towards the wrong side. Open the second fold to reveal the pressed lines. 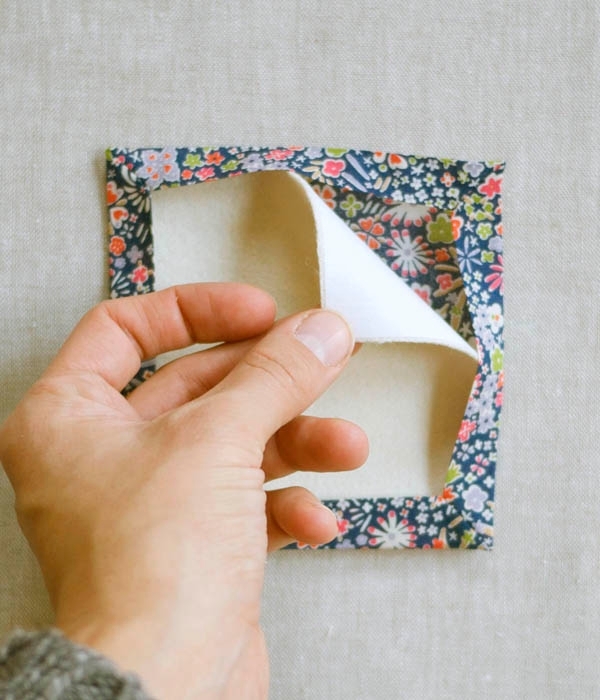 Starting at the point where the exposed pressed fold meets the center fold, sew to the outside edge, as indicated above by the white arrow. This seam should be at a 90-degree angle to the center fold and a 45-degree angle to the pressed edges. 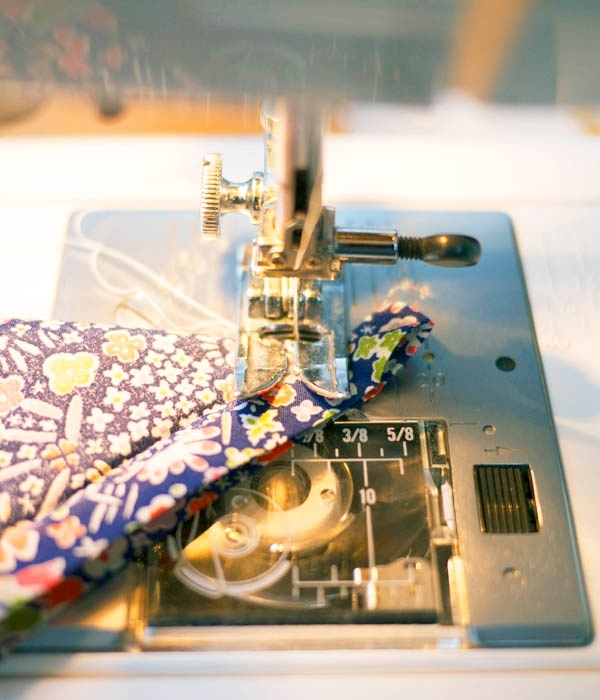 To make sure you are sewing at the proper angle, position the center fold so it is perpendicular to the presser foot of your machine. Trim the corner triangle of seam allowance, 1/8 inch from the stitch line. Repeat with the remaining three corners. Refold the hem along the previously pressed lines back towards the wrong side and press flat. The corners are now finished. With the wool side facing up, tuck one wool square under the hems of the Liberty piece. 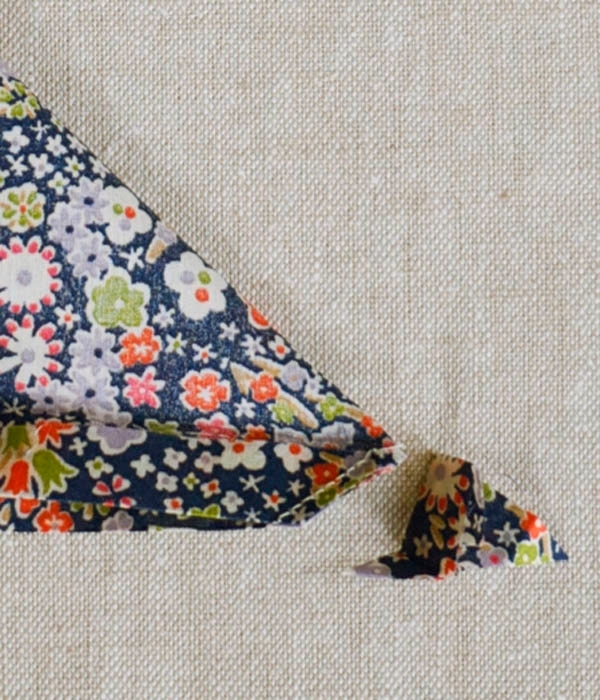 Edge stitch along the interior fold of the Liberty fabric. 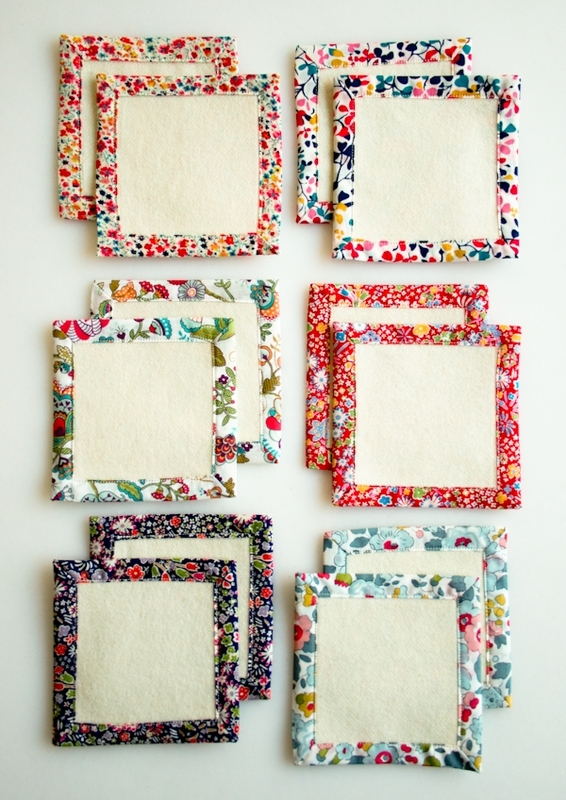 Repeat with all the the remaining squares for a full set of Liberty Coasters! These are great.. I was just in your store last week and there was way toooo much to buy. Thanks for the awesome share! 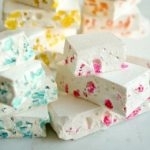 … absolutely gorgeous … I want a million gazillion of these!!! Thanks Corinne for making them so easy to do!!! 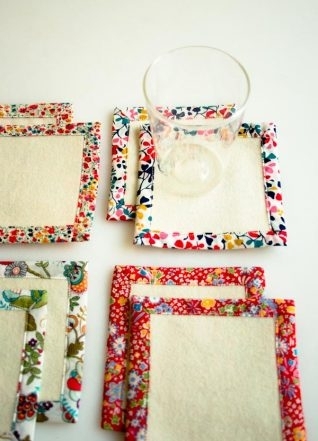 How do you clean coasters that are made with white wool? That truly IS a wonderful gift to give and looks fun to make. Thank you for another great tutorial! 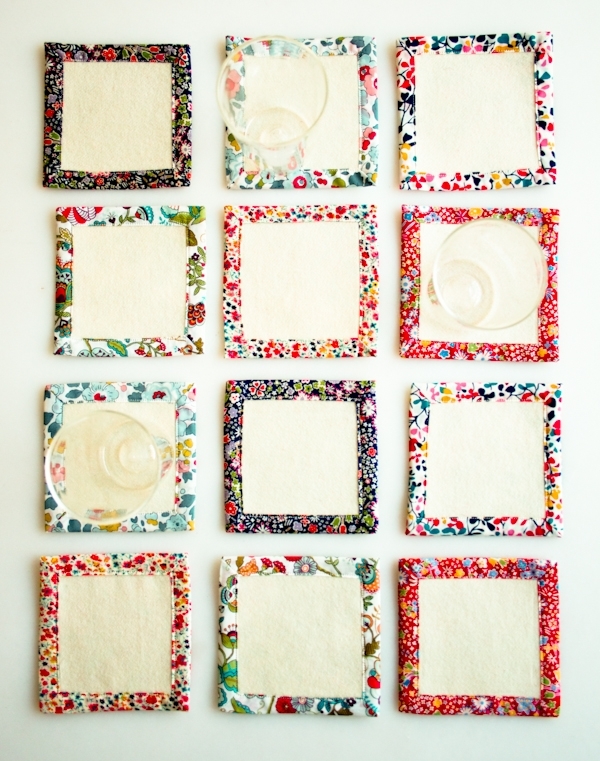 Lovely coasters and a very clever way of putting them together! Very cute! 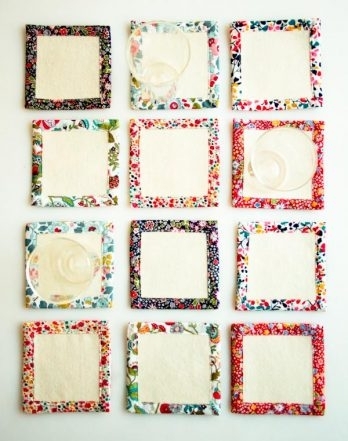 My mother and sisters made me dozens of coasters in this style before I moved abroad, using prints of NZ native flowers, ferns and other typical kiwi designs, stipple-quilting them with variegated thread. They were great hostess gifts for people I stayed with on my travels. I can understand your concern! But as long as you pre-wash all the fabric, these coasters are completely washable. Hi – I love these. 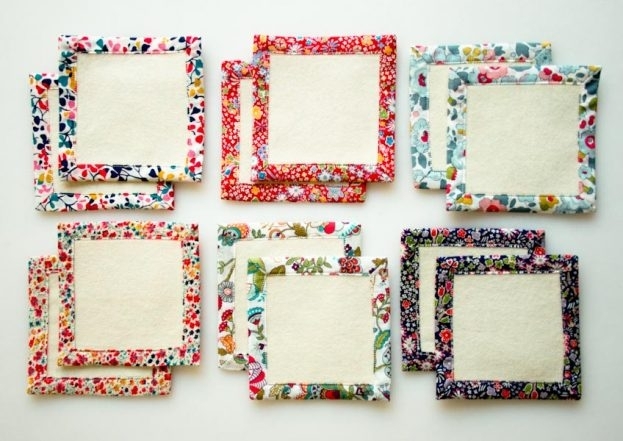 Would it be possible to tell us the names of the individual prints you've used here? I can't seem to identify them on the Liberty page. Thank you! 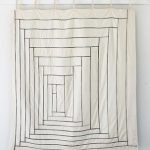 I am fairly new to sewing. 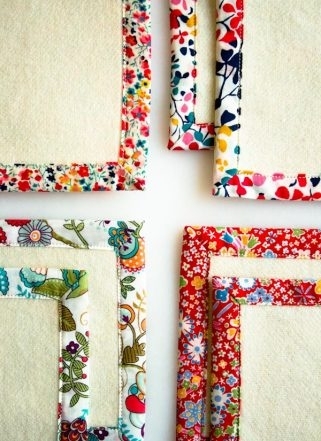 I would love to make these but I am allergic to wool. Is there something else I could use in place of it. Thank you for a great tute! 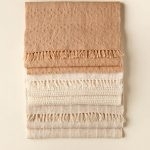 Globalweave Tight Weave Linen would be a great substitute. 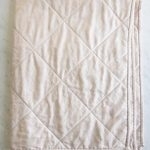 It is a beautiful fabric and because it's 100% Linen, it has great absorbency too. Unfortunately we are all sold out of it online at the moment, but you can email customerserviceATpurlsohoDOTcom and they'll let you know when it comes back in stock. I hope this helps! Please let us know if you have any other questions while you work on the project. 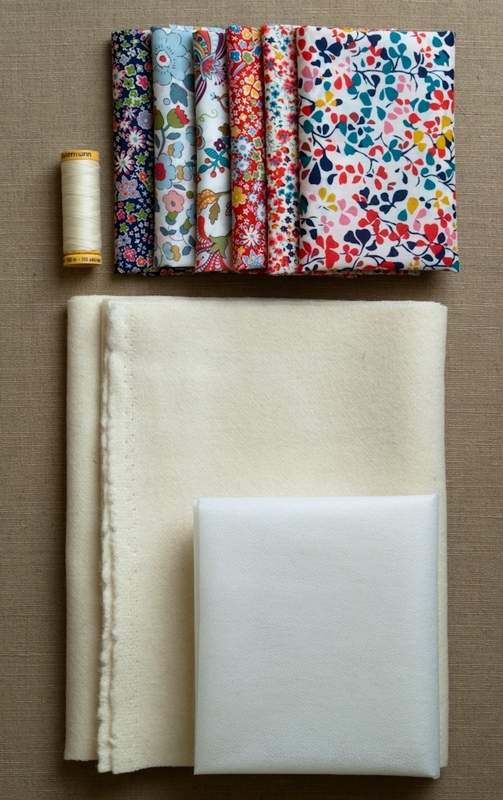 From left to right in The Materials photograph the Liberty of London Classic prints shown are . . .
Kayoko Navy, Light Blue Betsy, Mabelle Turquoise, Kayoko Red, and Phoebe Poppy. 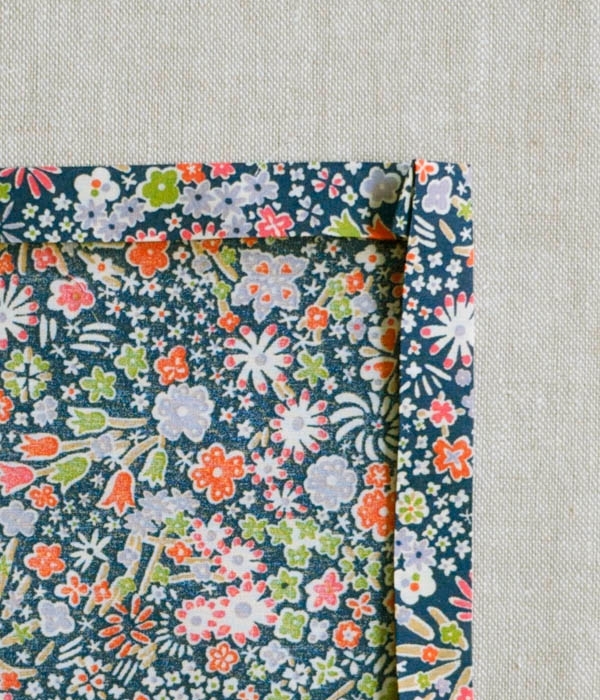 The last fabric in the pile is a Liberty of London Seasonal print, Nina Taylor in Teal. 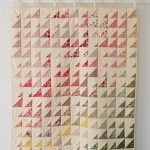 I have been making mug rugs for a couple of years as a quilter and these are genius. I currently am on your mailing list and have purchased from you. Great website and great shopping. Thank you!